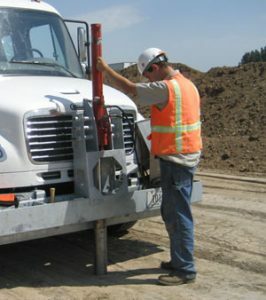 The hydraulic tube sampling (HTS) attachment, fastened to the front of the Freightliner truck that pulls CEER’s Geotechnical Mobile Lab, allows soil samples to be analyzed immediately in the mobile lab. Traditionally, researchers conducting soil analyses in the field needed to bring in a separate soil drilling rig and operator to collect samples. This meant that soil analysis required additional equipment on top of the equipment already included in the mobile lab. 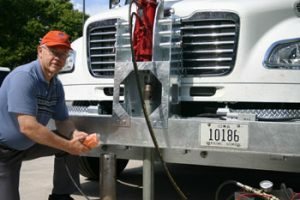 Moreover, the fuel costs of running the rig and transporting samples off-site drove up the cost and time used for soil testing. The HTS attachment eliminates the need for samples to be transported to an off-site lab for extrusion, storage, and analysis. With the attachment, the mobile lab’s research team can retain more control over soil testing activities and depend less on outside sources. Moreover, the shorter turnaround time can give quicker, less expensive, and more accurate test results. The hydraulic cylinder has a 3-in. internal diameter and a stroke length of 36 in. With these dimensions, the system has sufficient piston force and movement rate to meet most expected requirements for soil sample collection. The hydraulic cylinder operates in two positions. In the vertical position, it forces the Shelby tube into the soil. Shelby tubes can be 3 in. in diameter by 30 in. long and 4 in. in diameter by 12 in. or 16 in. long. When moved into the horizontal position, inside the box of the bumper, the cylinder forces the soil sample out of the tube and into a horizontal half-pipe (extrusion support) for safe handling. The cylinder is also stored and transported in that horizontal position inside the truck’s bumper. To operate the cylinder, a small, portable, hand-held controller box is used, allowing the operator to move around for the best view or to be right at the point of any critical cylinder movement activity during any operation. The hydraulic power unit is mounted inside an aluminum case designed to hold all electric power and hydraulic lines. The case size was designed to fit into an underbody tool box on the truck. The HTS attachment’s hydraulic power unit operates off of the truck’s 12-volt electrical system. Both the hydraulic cylinder and the hydraulic power supply at times need to be connected or disconnected. Those items’ weights were limited to around 75 lbs each for possible handling by one person. 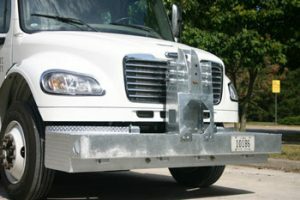 To mount the HTS attachment to the truck, the truck’s original front bumper was entirely removed and replaced with a heavy-duty box-type bumper. The new bumper is 7.5 in. tall by 7.5 in. deep and 8 ft. wide. This bumper needed to be strong enough to withstand a reaction force of 9,000 lbs (the weight of the front end of the truck) when forcing the Shelby tube 30 in. deep into the soil. Beyond a reaction force of 9,000 lbs, the front wheels of the truck would raise off the ground. Additionally, the bumper still needed to serve as the legal front bumper of the truck for normal road travel. To meet these conditions, most of the device, including the mounting frame for the hydraulic cylinder, was fabricated with 3/8 in. thick steel plate. 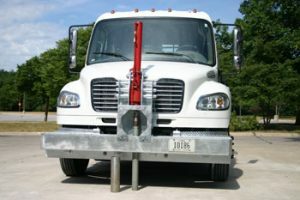 Additionally, two supporting jacks stored in the truck can be used to support the truck during sample collection, thereby reducing strain on the bumper. After construction, the bumper and mounting frame assembly was sent out for a hot-dip galvanizing. The total unit weight of the attachment is about 650 lbs. With the truck at the soil sample collection site, remove the hydraulic cylinder from its storage position inside the bumper and place the cylinder in the vertical position. Secure the cylinder using the two 1 in. diameter major pins. 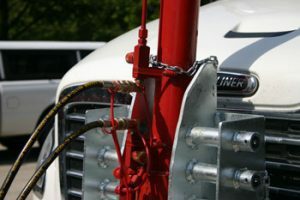 Connect the hydraulic power unit to the truck’s 12-volt power system using a cable located behind the bumper. Using quick-couplings, connect the hydraulic power unit’s two hydraulic hoses to the cylinder. Connect the Shelby tube to the cylinder. Using the forward direction button on the controller box, press the Shelby tube into the soil. The device can push Shelby tubes up to 30 in. into the soil to recover relatively undisturbed samples. Retrieve the tube from the soil using the reverse direction on the controller box. Seat a support jack at each end of the bumper to align the hydraulic piston in the vertical direction while pulling the tube out. Disconnect the Shelby tube from the cylinder. Remove the two major pins holding the hydraulic cylinder in the vertical position. Place the cylinder, in the horizontal position, into the fitted, secured space inside the bumper’s left side. The cylinder can remain connected to the hydraulic hoses. In the bumper’s right side, insert an extrusion plate for the 3 in. or 4 in. diameter Shelby tube. These plates are stored in the bumper during travel. Attach the extrusion support to the right side of the bumper. Place the Shelby tube in the horizontal extrusion position in the right side of the bumper. Using the controller box, extrude the soil sample from the Shelby tube into the extrusion support. The sample can be taken into the Mobile lab for analysis.